Why is National Shrinkwrap's PackageMaster the system of choice for soapmakers around the world? Soapmakers from the US to Trinidad to the UK to the Middle East and everywhere in between use National Shrinkwrap's PackageMaster Shrink System. What makes this system so popular? What sets this system apart is that the sealing mechanism is not affixed to a base, where you can only control the up and down motion of the sealing arm. Wth this wand-based system, you have the freedom to wrap your soaps by arranging them in a grid and can wrap multiple bars in a matter of seconds. The same system will also allow you to create multipacks, soap/dish combination packs, and beautiful spa and aromatherapy kits. Check out the video below for a demo and review from Ariane Arsenault, Candian Soaper, par-excellence. Which film is right for me? If you DO NOT want, or don't care if, the scent of the soap comes through the film, 75 gauge PVC is the best-looking film, and is the easiest to work with. PVC is crinkly, with a beautiful glossy finish. It makes your packages sparkle, which is why PVC is the first choice for gift applications; Spa Kits, gift sets, gift baskets etc. It's often a good choice for soaps placed in retail outlets other than your own, as it looks great, and typically, will not allow the scent through quickly, if at all. We often hear complaints about "hard, rough edges" from soapers who are using the pre-made PVC shrink bags. Be advised, that those bags are typically made from 100 gauge PVC...which is way too thick for such a small item as a bar of soap, resulting in those sharp edges. 75 gauge is the recommended thickness for PVC wrapping small items. You'll find it's the best choice for candles as well, in terms of appearance, so if you are wanting the glossy look-and-feel of PVC for you soaps and candles, but still want the scent to come through the film, think about Perforated PVC, the same film, with a film-wide network of tiny pinholes that will allow the scent to come through. All that having been said, most soapers DO want the scent to come through, and that where the polyolefins come in. Most of our soapers use 75 gauge Polyolefin. When SHRINKING the film down on an irregular surface, the areas of film that are not in contact with the surface of the soap are more heat sensitive and you are more likely to burn a hole in the film. The standard film (no perfs) protects your humectant-based soaps from being as easily affected by the environment (i.e. losing moisture to a dry environment or getting gloopy in a moist one). Within the confines of a shop, or if you ship mail-order, with a little safe handling, you could do much of the above with the thinner, easier to work with (AND easier to blow a hole through if-you-get-careless-with-your-heat-gun, 60 gauge film)...but if you are often moving your product about, like, to fairs, festivals, outdoor sales and the like...the stronger, thicker, 75 gauge film, while it might take a tiny bit of extra effort to cut and seal, and a bit longer to shrink down...will make for stronger packages that will stand up better to the repeated handling during shipping and un/packing..and setting up your racks or displays...and while your customers are doing whatever it is that they do to your bars. In the same vein, you might want to wrap Multi-Bar packs, gift sets or soap/dish combinations. These would also benefit from the added strength and durabilty of 75 gauge poyolefin. My personal recommendation is that M&P soapers do NOT use perforated films if they often sell in very humid or rainy environments as they allow moisture in more easily, and in an arid environment, will enhance the effects of dryness on your bars...but having said that, many of our M&P soapers do use the 60 gauge perforated poly and are happy with it...especially, if you do NOT typically sell your bars outdoors. So, in a nutshell, here are your film options, in order of popularity, amongst our legions of soapmaking customers. Once you have your system, you can get up to speed and be productive from day one -- just follow the four steps below to reduce your learning curve (and definitely watch the video!). 1. SET IT UP ON A SOLID SMOOTH SURFACE! You want something that "pushes back" when you push down on it (not folding card tables and those 8' white plastic tables typically found in warehouse stores like Costco). If you do use one of those "unsuitable" options, put a sheet of plywood down to make it more suitable (even then they may still result in spotty performance). Kitchen counters are often too high, so you need something like a desk, kitchen table, or dining room table. You want a level at which you can use your shoulders to provide the downward pressure for the sealing wand, not your elbows! 2. MAKING A SEAL IS A 3-STEP PROCESS: Push-Tilt-Pull. Push on the film, with your palm in the middle of the handle (to evenly distribute the pressure along the width of the sealing wand). WHILE YOU ARE PUSHING (don't let up! ), tilt the wand slightly, toward the roll (12:00 to 1:00...just enough to get the left side of the sealing wand OFF the surface of the film). While you are PUSHing down on the wand and TILTing it towards the roll, PULL the film away with your left hand. Don't pull the film away from the middle, grabbing 18 inches at once. Rather, start at the top or bottom of the piece you are trying to pull away and pull it away at an angle,like a banana peel. DO NOT PULL UP and OUT -- pull to the left. You'll end up doing all three things at once. PUSH-TILT-PULL. You can see this in the video below. It will work if you don't make your seals properly, but you'll have to re-do more soaps than you would otherwise. Don't let these instructions scare you, MAKING soap is much harder and more complicated than wrapping it! 3. LEAVE SPACE BETWEEN THE BARS AND THE WAND WHEN YOU ARE MAKING YOUR SEAL. You can reclaim half the space AFTER you've made it (watch the video! ), but if your bars are 1" thick, then you need to be just over 1" away on both sides of the wand when making your seals. So, if you are placing your 1" thick bars of soap into columns, the columns need to be 2.5 inches apart! After you've made the seal, slide the bars still in the film over to the sealed edge. You only need to leave the extra room while making the seal, not once it's been made. That's why dry bars, which slide about the film easily, are easier to wrap than sticky M&P bars. For tacky M&P bars, it's easier to wrap a single column at once (eliminating the need to slide them over to the seal), and then, when you have 4 or 5 columns, cut ACROSS all of them at once. 4. Use the heat gun like you would a can of spray paint, 4-8 inches from the surface with a steady BUT CONSTANT motion. Do the "sides" of the bars first to keep the seams on the side, then the bottom, and, lastly, the "top" of the bars. Uneven surfaces (usually on top) are more difficult to shrink, so that's why you do them last. 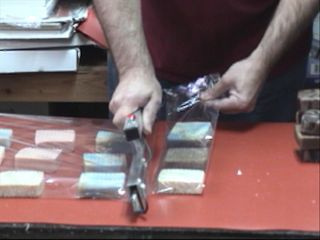 When wrapping a bar with a surface where the soap does not come in direct contact with the film (like with embeds sticking out of the top) the areas of the film with NOTHING touching them, will be more heat-sensitive than the rest of the bar where the film sits up against the surface of the soap. Usually this is the top of the bar, and fortunately, the top is the last side you will usually shrink down. If the film sticks to "wet spots" on the bar, the heat gun will NOT remedy this -- only drier bars or thicker film will. Let the heat gun warm up for 10-15 seconds on first use of any sealing session. Otherwise, you'll get a false reading of how close you have to be and how much movement you need to shrink them down neatly and professionally.